Life Is A Struggle, a photo by Ayala Moriel on Flickr. "When we are stricken and cannot bear our lives any longer, then a tree has something to say to us: Be still! Be still! Look at me! Life is not easy, life is not difficult. Those are childish thoughts. . . . Home is neither here nor there. Home is within you, or home is nowhere at all". If your sense of belonging does not come easy, trailing alongside the trees gives a great lesson and a sense of proportion. A single tree in the rainforests provides oxygen supplies for a year for ten people - in only one season of its existence (Arbor Day Foundation). "On average, one tree produces nearly 260 pounds of oxygen each year. Two mature trees can provide enough oxygen for a family of four" (Environment Canada). I'm awed not only by their stature, but also by what they have silently witnessed, and above all - to their dedication to light and life. 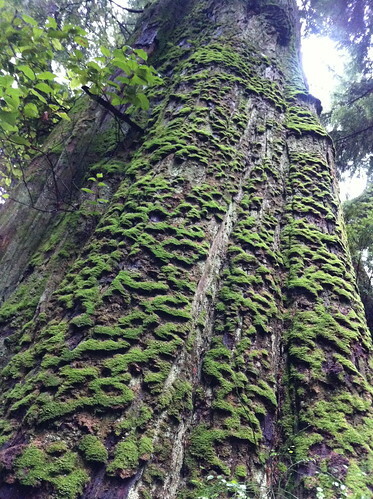 There are 3 main trees in our beautiful Pacific Northwest forests: Douglas Fir (Pseudotsuga), Pacific Red Cedar (Thuja plicata) and Western Hemlock (Tsuga) and Sitka Spruce (Picea sitchensis). I'm still learning how to differentiate between them: they are all so big and often times their needles are so far out of reach that there is no way of examining their needles and comparing their shapes. And then the trees are young it's the opposite problem: you can see the needles, but the trunks are still quite similar in appearance (at least to my untrained eye). These amazing trees can live several hundreds and even well over 1,000 years! So, as I struggle to find courage, motivation or inspiration between my 4 walls - I step out to my "back yard", breathe deeply - and try to listen to the trees. Glad someone else, not biased like me, have said it better than I ever would have been able to. Love or Money by The Alembicated Genie. 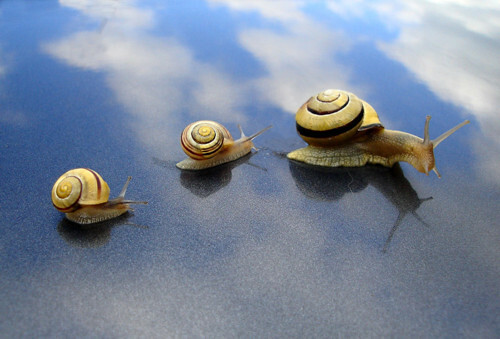 snails, a photo by JasonOzur on Flickr. "Slow down and remember this - most things make no difference. Being busy is a form of laziness - lazy thinking and indiscriminate action." It couldn't be more relevant than to now. We always seem to be in a rush to get somewhere, to get something done, to meet more people -- that the important things seem to sift away and fall to the bottom of the pile. Mindfulness is our only savior in this hectic rat-race towards what often tunrs out to be not all that worthy finishing line. Nature will always get her ways. If we don't stop to breath, it will give us a cold so that we appreciate our breath better. Allow me to make up for all my unmade New Year's resolution with this post (in case you were wondering - I was too occupied with adjusting to extreme time differences and temperature drops and completely lost my opportunity to even buy a 2013 agenda book). With each year that goes by I realize how it all boils down to mindfulness and how important this is to our lives. Living to its fullest each moment as it passes through us; embracing life with all of its challenges - even savouring the painful experiences. We'll always be able to look back fondly to these challenging times and appreciate the lessons they taught us and are still relevant in the present. 1. Be mindful of my breathing, thinking, and the intent I put in what I do. 2. Remain authentic to my inner voice - which is inevitably connected to my creative side which churns up scents as my means of self-expression and story telling. 3. Release absolutely no new scent whatsoever in 2013. 4. Perfect as much as I possibly can the packaging, branding and accessibility of my existing line. In relation to 4, I'd like to add that I have thought long and hard about my collection over the past year, and have divided it down to 4 collections, and 49 scents in total - that should keep both me and my customers interested and busy for a while. Now it's just the question of printing and setting this into action; plus the scariest part of the task: re-branding the website. Any takers for the task? There is going to be plenty of excitement for 2013: Broken Hearts Tea Party for Valentine's on February 10th; Artisan Fragrance Salon March 24th, my appearance in Blackbird Apothecary as part of the Northwest Indie Perfumers Circuit on May 11th, and of course - my Floriental Week May 13-17. Hope you'll join me for one or more of these events! The Garden of Forking Paths, a photo by Ayala Moriel on Flickr. "This web of time -- the strands of which approach one another, bifurcate, intersect or ignore each other through the centuries -- embrace every possibility". Into the Woods, a photo by Ayala Moriel on Flickr. The forest is calling me these days. And thankfully it is right at my back yard. The water I frequently visit as it’s my most immediate calling. The proximity to water and all it’s aspects is very soothing: the physical and metaphorical reflection, the lulling sound of the waves’ rhythm... Sometimes competing sounds are complementary, sometimes dissonant: the waves clashing on the rocks, my boots tapping on the seawall at the exact pace of 2 full-circles of the aquaplane’s propellor... I observe, listen, become one with the moist air, the sights and the sounds. And come back feeling cleansed and refreshed. 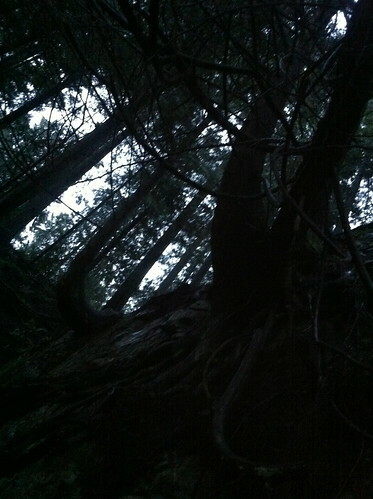 The forest, on the other hand, calls for digging deeper into the secrets of the soul. It might hold some wonderful surprises, but also some scary ones - encountering fears and demons in the darkness between the branches and amidst the bogs and marshes of the woods. Circling Beaver Lake this morning, it was inevitable to think about death and decay. Back to the marshlands though: it’s being sucked dry by invasive waterlilies: foreign beauties that take over the lake and turn it into a blooming garden. Like ornamental dolls, they look prettier and smell nicer than the skunk cabbages, but unfortunately are just nearly useless for the wood ducks, beavers and other wildlife that call this lake their home. If the forest is the place of healing of the planet, the green lungs that reverse CO2 into oxygen - then we must start eradicating the invasive species that threaten it from thriving. Urban meets nature in every corner I set eyes on here. In the Pacific Northwest it is sometimes hard to say who wins the battle: while logging and concrete are a constant concern for wildlife and natural habitats -- moss and wandering ferns take over my porch without any cultivation attempts, and coyotes roam freely in the city. The rainforest is a constant source of inspiration to me, not only because of its rich flora and fauna; but also because within it lie so many answers to life’s quest. And the most difficult search is - when you don’t even know what you’re searching for... Thankfully, the forest provides some answers even to that. Amid the greens and browns, an orange colour pops out: no, it’s not a persimmon that a careless park goer spat out on a log. Nor is a group of lanterns on a distant, dead Douglas fir that is still standing upright. 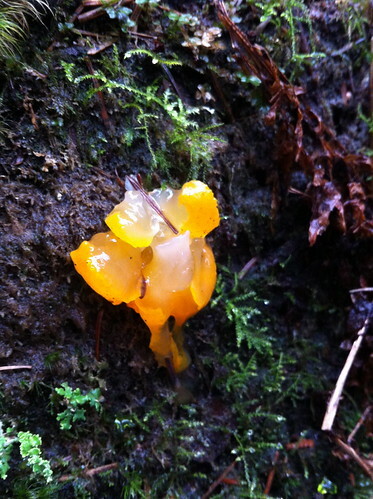 These are the most peculiar, slimy bright orange fungi. You are probably wondering by now what is the point of this post, as I do. There is no point, except for the wonderment of the forest itself. 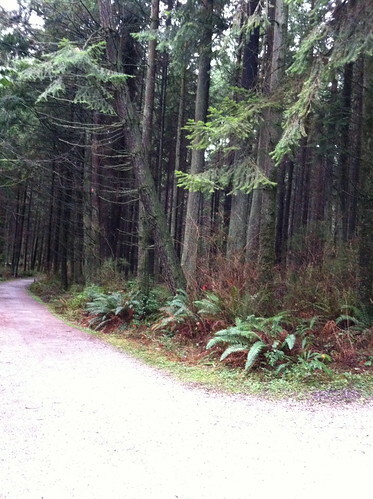 No matter what else I will bring up we will end up on the same intersection as in the many paths and trails that divide and meet again in Stanley Park. Early Almond Blossom, a photo by Ayala Moriel on Flickr. It's full moon & the New Year of the Trees (a rather obscure Jewish holiday). 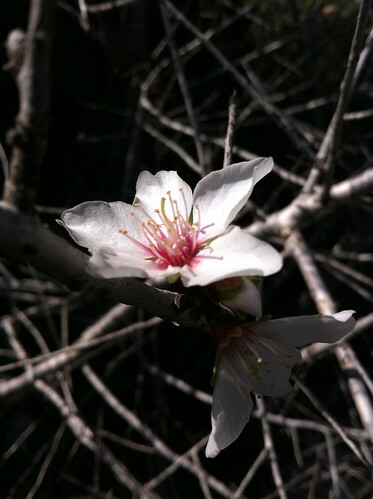 If you have an almond blossom perfume, now is the time to wear it - the almond trees are traditionally in full bloom at this time of the year in Israel (though the almond flower in the picture was taken sometime in mid December). There aren't too many almond perfumes in my repertoire, or in my collection. Farnesiana with its violet-macarons and marzipan aroma comes to mind. Oh, and there is also the almost forgotten KenzoAmour LeParfum, as well as a couple of soaps I adore - l'Occitane's Almond Delicious exfoliating soap and Royal Herbs' Honey & Oatmeal soap. And last but not least - Gabriel's Aunt Biscotti candle. And back to the topic of almonds - it's a note that's mostly associated with benzaldehyse - that molecule that smells like bitter almonds, although isn't quite bitter on its own. It's what you taste in almond extract, and most cherry flavouring. Pure, 100% natural bitter almond essence is hard to find because of some legalities . For food use, the prussic acid (aka cyanide) must be removed, and you have to show some certification before purchasing it even for fragrance use. 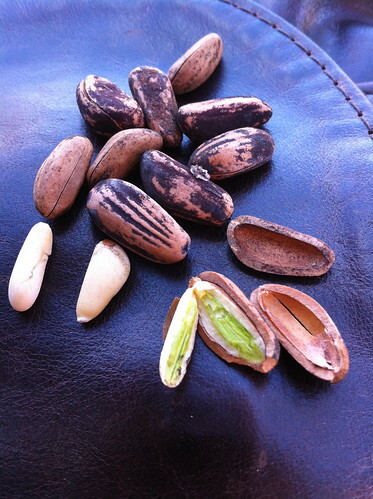 And there is also the caramelize almond like aspect of tonka beans, a characteristic of coumarin. You'd also find coumarin in high doses in hay absolute and liatrix (deer's tongue) absolutes. However, neither remind me of almonds as much as tonka beans: they smell more like luscious raisins. Also appropriate for Tu BiShvat, when dried fruit get more attention than any other time of the year. Last but not least: heliotripin, which is hard to find as a natural isolate (but naturally occurs in Tahitian vanilla beans). Also known as piperonal, it smells like marzipan and cherry pie, and very much like the flower heliotrope - sheer heaven. A friend of a friend posted a link to this poem on one of the major social networks, and I found it so true and inspirational that I hope you will scroll over there and read it too! Check out my updated calendar for 2013, including a new series of culinary & aromatic workshops at Ayala Moriel Parfums Studio. All workshops take place on Sundays from 1-4pm at Ayala Moriel Parfums Studio. 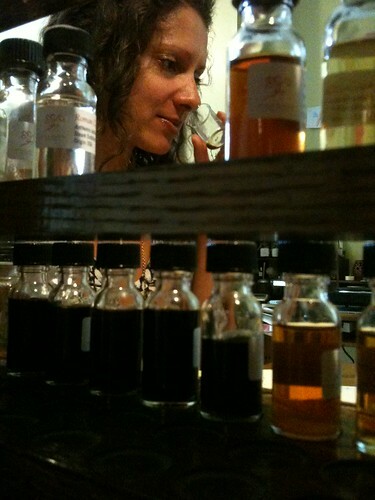 Please note: there are only 2 spots left in this professional training natural perfumery course. You need to apply with a CV and a coverletter and pass an interview to qualify for this program. 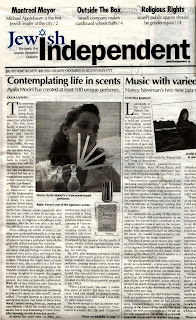 Please note: This is part of Ayala Moriel Perfume School's professional training natural perfumery course. You need to apply with a CV and a coverletter and pass an interview to qualify for this program. 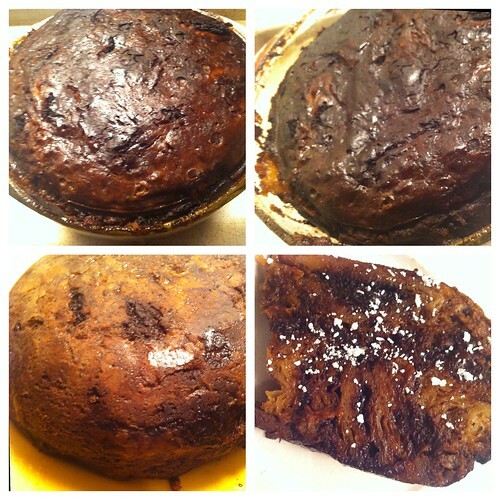 Banana Chocolate Bread Pudding, a photo by Ayala Moriel on Flickr. This morning I didn't need the alarm clock: I pleasantly woke up to a luxurious, rich, nutty scent of burnt butter, caramelized bananas and steaming chocolate... Can you think of anything more pampering, surprising and special than to wake up in the morning to the smell of freshly baked goods, come from your own oven? Would you believe me if I told you that this is possible to be done without any effort whatsoever such as waking up at the wee hours of the night, measuring or weighing ingredients and worrying if you'll have time to eat them before rushing to work? Sounds too good to be true, I know... I would agree with you unless I were to experience it myself with this one quirky dish called bread pudding. If made in the steaming technique this new recipe of bread pudding from a Jewish cookbook that I suspect was designed as a breakfast affair for Saturday morning - that one day in the week when observant Jews usually need to forgo most hot meals unless they were prepared on a hot plate in very slow cooking. There can be as many flavour variations to bread puddings as the types of stale bread used to prepare it. And you can always add a little bit of this or that. I've been fantasizing about a banana and chocolate affair for over two weeks and it was about time to do something about it. I even had 3 overripe bananas begging for attention. So last night was the night to starting working on that. - Cool down for 10 minutes. - Meanwhile, mash the bananas well. - Pour the chocolate mixture onto the bananas. Add the eggs one at a time and beat them between additions. - Butter generously a pudding bowl or another heat proof bowl or casserole dish (such as ceramic or pyrex) or a deep pan. - Place slices of the pain au chocolate in the bowl and arrange them as neatly as you can, in one layer. - Pour the banana, hot chocolate and egg mixture over the bread slices. Sprinkle with the chopped chocolate. - Create another layer of bread, then pour the batter and sprinkle with more chocolate. - Cover with a lid (or with aluminum foil). - Place the pudding bowl inside a shallow pan filled with water and place in the oven. - Bake over night (for 8-9 hours). - Meanwhile, get your beauty sleep. You'll wake up to the most amazing breakfast - and your home will smell heavenly! - When you remove the pan from the oven, the pudding will be all puffy. Please note that it will collapse (even if you leave it in the oven with the door slightly open). That's normal, and would not take away from your enjoyment. I promise! - If you used a bowl, invert the pudding onto a serving plate, and dust with powdered sugar. This pudding is best served hot or warm. Goes very nicely with a cup of black tea with milk (we had a banana coconut tea from Murchie's for the occasion), a cup of coffee, or even just a glass of milk. Somehow, with all my preparations for the holiday markets in 2012 and my trip to Israel, I forgot to tell you about the incredible coverage me and Etrog got in The Jewish Independent - the only Jewish Canadian newspaper on the West Coast. In a revealing interview titled Contemplating life in scents, I talked about my early beginnings as a natural perfumer, immigrant, single mom and all the other obstacles that eventually lead me to this perfumed path. A dear friend brought me a copy from the Jewish neighborhood in Vancouver, and my grandmother was ever so proud to see the hard copy! 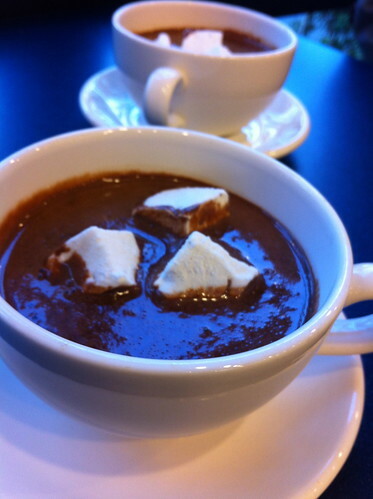 Espionage Hot Chocolate, a photo by Ayala Moriel on Flickr. After a long afternoon of learning how to make fresh pasta with Pasta Famiglia, I strolled over to the nearby Nymph East - the new location of CocoaNymph which opened this fall. It has all the old goodies but in a new fresh location that has great potential - including a regular offering of chocolate making workshops and a growing full-service cafe menu. 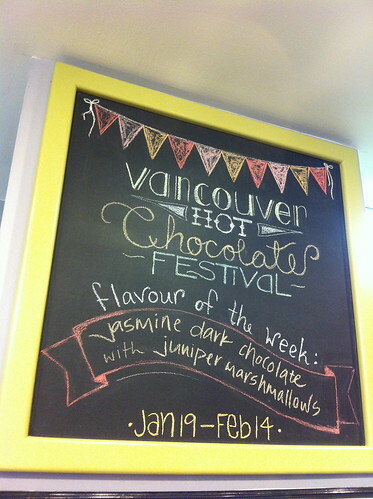 For the Hot Chocolate Festival (January 19 - February 14), CocoaNymph concocted a special limited edition beverage that shows Rachel Sawazky's skill and daring imagination: the Espionage hot chocolate, which is infused with jasmine essence and topped with juniper marshmallows. Like the chocolate bar we created together, it packs a punch, surprises the taste buds and stimulates the imagination. Personally, I was reminded of the thick "Shokolada" that Maestro Secundus Minutius Hora poured out to Momo when she visited the heart of time. It's the kind of beverage that makes you stop in your track, contemplate, and savour every moment. Which is the key for happy living! Untitled, a photo by kivellotephotography on Flickr. Every once in a while, I owe myself a visit to the circus. It doesn't only wake up the sleepy towns in Carnivale, but also the soul: bringing unsurfaced fantasies into the mundane and awakening the never-ending quest for more. 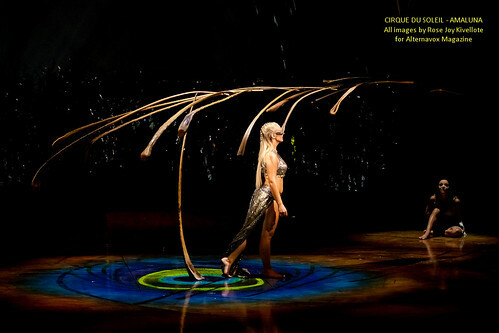 And so I found myself at Cirque de Soleil's newest performance Amaluna last night, amazed at the commitment and dedication that each moment of the show requires from a host of artists - off and on stage. The show surrounds the moon and it's fluctuating cycles, battles between fire and water, and the constant quest for love despite obstacles. One of my favourite scenes was the balancing act of sticks shaped like prehistorical bones, floating in space in a breath-stopping, slow-motion spin (pictured above). The morning after, I pulled out my sample of Eva Luna that Charna from Providence Perfume Company kindly sent me at the end of 2012: a sheer concoction surrounding two unlikely partners: carrot seed and jasmine. Both related to the moon (as most aromatic seeds and white flowers are), it just seemed befitting to wear after the show. Eva Luna begins with the jasmine being far more prominent than the carrot, paired with watery spearmint note. Bright, sheer and beautiful, it soars above the skin like a seagull from the water. The carrot seed whispers in the background with warmth anchored by the muskiness of ambrette seeds. Chased with a fresh yet sweet amber and frankincense accord, Eva Luna is unexpectedly easy to wear, more of a summery daylight scent than a lunar orchestra. New car scent? Forget about it... Nissan wants you to think about green tea when you go for your next test drive. Alternatively, you may douse yourself with Demeter's sushi cologne*. * Thanks to Noam Dehan for the link. Edward Bess "Eau La La"
Moss Gown - Providence Perfume Co.
Qajar Rose - Lalun Naturals, Inc. RAW SPIRIT "Firetree" Fragrance Oil by World Senses Pty Ltd. The winner of the “Indie” FiFi Award will be announced at the “Indie” FiFi ceremony to be held at Elements Showcase in New York city on Monday, Jan 28 at 7pm. Good luck to all the nominees. There are more than a handful of talented perfumers who I know in person I consider colleague and friends and I'm really hopeful that one of them will win! Wouldn't it be refreshing if someone who actually designs and/or makes their perfumes by hand will be one of the top 5 winners. It will be a stepping stone for independent and artisan perfumery. 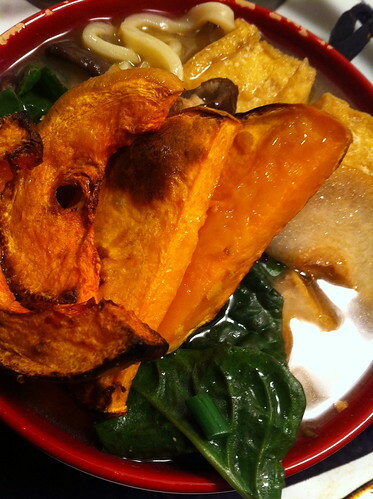 Asian Pear & Roasted Butternut Squash Udon, a photo by Ayala Moriel on Flickr. Yesterday I made an udon soup for the first time. An Asian pear & roasted butternut squash udon, to be exact. I'm not a fan of noodle soupls in general. But udon noodles in particular strike me as over-the-top thick and awkward. So this was very adventurous for me! The starting point was seasonal, locally grown ingredients that I wanted to use up in a fresh way. I was tired of resorting to my old ways of cooking: shiitake mushrooms (not a stir-fry again! ), butternut squash, which I love roasted but wanted to see if they'll work with these particular mushrooms (they go smashingly well with portobello mushrooms). I also had a wackload of Asian pears which I was considering using in a salad again (a regular favourite on our table since last fall). Short search in two recently found and very resourceful vegetarian cookbooks - Plenty and rebar - was a proof that the latter is the ideal choice when cooking seasonal is the guideline, and a further proof that sustainable nourishment can be exotic indeed. The particular recipe of choice included mostly ingredients that I found at the farmer's market that weekend (except for the scallions, condiments and the added deep fried tofu). This winter I've decided to make my own broth rather than contributing to landfills with cartons of emptied organic vegetable broth. Besides the earth-concious benefits, it also makes the house smell incredibly welcoming and cozy while undergoing an extended simmer. Creating a broth, in particular, seems like constructing a perfume. There are layers upon layers of flavours that are essential for creating depth, character and a backbone or foundation for other delicious dishes - soups, stews and, of course - risotto! Since I only use vegetables, it's very important that the broth has certain materials in it. What most seem to miss in vegetarian cooking is that mysterious depth that so many find lacking in vegetarian dishes. The secret to that is using dried mushrooms. I find that give it that umami flavour and meaty depth. And paired with the right spices or herbs, it can border on perfection. You might just never look back at boiling bones if you try my recipe for the ultimate vegetable broth (I promise I will post it next week). The challenge with this soup was not so much the broth, which I was making anyway for a number of other "projects". It was the seaweed. I found it to be way too fishy for me in this context and had to add the cinnamon to balance the flavours out. You might want to try it without seaweed and see how you like it. There is no shortage of depth without it, even if you're using plain water rather than pre-made vegetable broth. 2 handful of greens of your choice (i.e. : collard greens, spinach, bok choy, gai-lan, watercress, etc.) rinsed and drained, cut or torn into large pieces if necessary. - Cover the mushrooms, cassia bark, star anise and seaweed with the water or broth, and cook on low heat for an hour, keeping it just under simmering. - Add the ginger, tamari, sake, mirin and miso. Stir well. - Add the sliced Asian pears and greens, and cook just until the greens are wilted but are still a bright, vivid colour. - Remove from heat without the lid. Meanwhile, prepare the Roasted Ginger Squash:1 butternut squash, halved and sliced, with the seeds removed. - Roast in the oven at 400F for 20-30 minutes, until golden-brown or crispy. This is a more healthful and easy to prepare alternative to tempura. The roasted minced ginger adds a nice crunch! 2 packs of fresh or frozen udon noodles (cook according to the package). 1 package deep-fried tofu (rinse under hot water to release excess fats). - Place noodles and tofu at the bottom of each serving bowl. Pour broth over, and place vegetables neatly on top, making sure that each bowl gets an equal amounts of each vegetable (or fruit!). - Place slices of roasted butternut squash on top. - Garnish with sliced scallions and a drizzle of dark sesame oil. Vanilla Beans, a photo by Daniel Hurst Photography on Flickr. My vanilla bean jar broke, and so I had to find another jar... While transferring the bundle of moist beans, their robust aroma clung to my fingers. For hours, I could smell a rich, balsamic, slightly woodsy scent emanating from my fingers. Vanilla is a unique aroma in that it purely positive, always recalling grandma's baking and similar homely comforts and overall goodness. It's hard to think of a way to kill vanilla for me, definitely not the pure extract or whole vanilla beans. But as I was living with vanilla on my palms for nearly a day - I could also smell a hint of what I found disturbingly reminiscent of indole: That substance which is more commonly associated with ripe bodies, human feces and (more positively) jasmine and other heady white flowers. Idole naturally occurs in a number of things, ranging from bonito flakes, butter, fish, egg, malt, tobacco and rum to white flowers such as jasmine, narcissus and ylang ylang. I'm still not finding much literature suggesting it occurs in vanilla (save for one place that suggests using it in vanilla flavouring) but that's what my nose tells me. The disturbing discovery that the eternally comforting scent of vanilla, that single scent with no negative association, might actually contain the controversially-scented molecule of indole made me realize how much I have grown to literally live through my nose. I assess - and immediately cast judgement - on anything I encounter in my life based on scent alone. And this is not restricted to food and beverages alone: I sniff out anything and anywhere, as long as I can breathe in it: dwellings and living spaces, banks, clinics, street corners, corner stores, pharmacies - you name it. I've always been that way, tending to visit friends more often if I like the scent of their home... And I could literally smell danger in my house - i.e. the mood change of my family members - just by smell alone. The other side effect of being very scent-concious is that a lot of "nice" commercial scents that I used to like or at least enjoy getting a whiff of are losing their mystique once I become acquainted with some of the modern day molecules that dominant them. Scents can seem a lot more alluring when you don't actually know what's in them... On the other hand, my appreciation of more subtle (and more often than never - the purely natural) goodies from tea and wine to fine fragrances has increased ten fold since I began strolling this path. I can now enjoy the muskiness of ambretolide that's whispering through scents containing ambrette seed essences - including some of the more subtle of my own creations (i.e. : Kinmokusei), which now I can enjoy their complexities much more than before. The ionones, which before were only a guess of what they were and how they behaved are revealing more of their beauty to me, including in some of my favourite oolong teas. I can sense the bracing spiciness of clove's eugenol peaking through the innocent looking ylang ylang. And, apparently, I can discover indole in my kitchen. Have you experienced a heightened awareness related to the sense of smell in daily life that was surprising, disturbing, mind-opening or just plain delightful? How does the sense of smell change your daily life? Post a comment and enter to win a decant of the ambrette-seed laden No. 18 by Chanel (part of their Les Exclusifs collection). 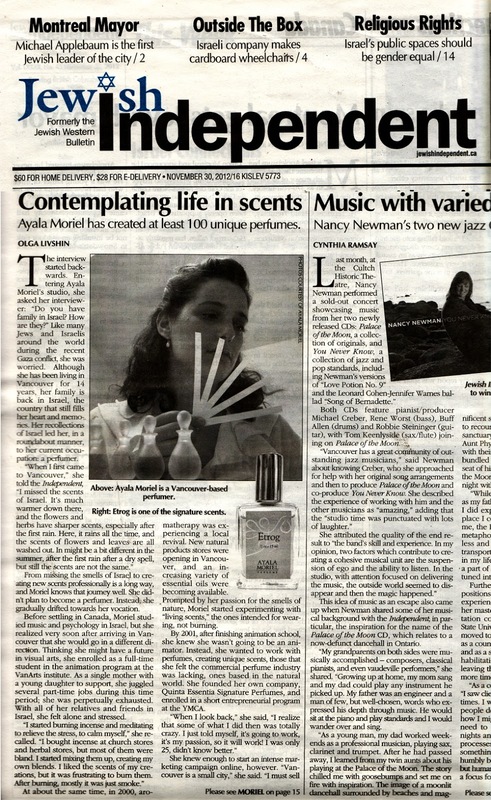 This morning I got the exciting news that Treazon by Ayala Moriel Parfums has been confirmed as an official 2013 Indie FiFi® nominee. I'm looking forward to see who the other nominees are - and will post a link for the full list as soon as it becomes available. Update: The nominee list can be found here. It's very heartwarming to see how well received Treazon is - I just recently found out that is was chosen as "sexiest perfume of the year" by The Non-Blonde! After thinking long and hard - I've made some changes to my sampling program on AyalaMoriel.com, to make it simpler for you to discover my perfumes. From now on, you can order any scent you want (including the Liquid Poetry collection) individually or as part of a sample set of six, eight, ten, twelve or fifteen samples elegantly packaged in a jewellery box. Naturally, the prices had to be adjusted accordingly. I based that on an average of $15 per sample, and about 50% off for all the sample packs so it's more affordable for customers the world over to experience my entire collection - including the more artsy and rare creations. cacao, a photo by prima_stella on Flickr. 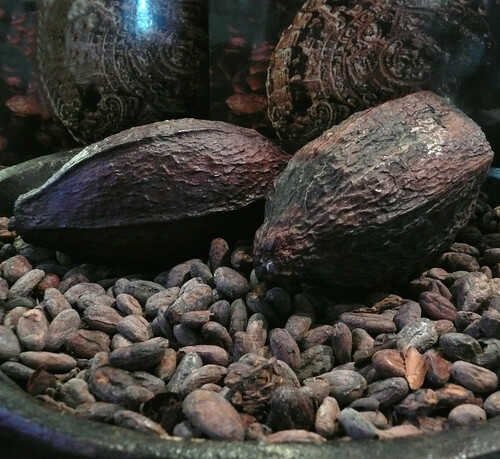 Not too many know it, but both tuberose and cacao originated in Mexico. Two raw materials that are of unparalleled, inimitable quality. Addictive and almost maddening substances. And Charna Ethier of Providence Perfume Co. have made the bold step of melding them to create something new and unique. Cocoa Tuberose opens with tuberose as the main note, paired with juicy grapefruit for an uplifting effect of otherwise very dark, dense composition. If you're not familiar with pure, natural tuberose absolute, you might not find it to be as floral as expected. Tuberose absolute has an almost green, waxy feel to it underlined by a buttery sweetness. It's not as flowery as, say, jasmine or ylang ylang. And in this perfume in particular - tuberose is used in an original way, where its grassy and butter qualities balance the heavy, seductive gourmand notes of chocolate. But the story does not end here: the chocolate is used very subtly as in the expert hand of a chef who just wants an accent of cacao in a savoury dish. Nutty vetiver comes forth, and plays a duet with powdery, caramel-like tonka bean. Despite the depth and complexity of these distinctive, opposing notes are seamlessly blended in such way that not only do they not overpower one another, but also create a new harmony that is unexpectedly savoury rather than decadent. Cocoa Tuberose is one of the sexiest perfumes I've tried in a while, and although the name might imply a very girly scent - I know it would smell fantastic on both men and women. It appeals to a very grown-up, refined taste and is well-balanced and satisfying, like a square of smooth woody-floral dark chocolate. Thank you for everyone's continuous readership, comments and support of what I do on SmellyBlog and beyond. These past 4 weeks I've been way too busy traveling and catching up with my family back home in Israel, and barely had a moment to contemplate 2012, not to mention post anything of substance here. Similarly, I've been barely following up on several giveaways from last year, which I would like to remedy before we proceed to more exciting territories such as perfume reviews, new ingredient features, recipes, and more - on a regular basis again. 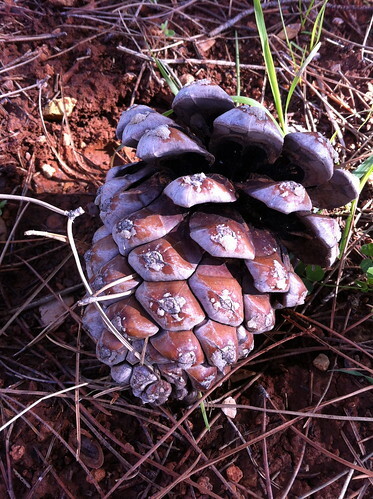 The mystery plant of the Christmas giveaway is indeed the pine nuts from the stone pine (Pinus pinea). Congrats to Mer - the lucky recipient of a care package including rose incense, chai rose tea, and wintery perfumes from my list of favourites. You're the winner for this giveaway not only because you guessed the answer correctly, but also you were the lucky draw winner from among the 3 who guessed it to be pine nuts. Please email me your address so I can send you the goodies. The winner of my Annual Perfume Review Contest. Congratulations!!! You will receive a mini of Treazon (value of $90) once you inform me of your snailmail addy. Hope you enjoy it immensely! 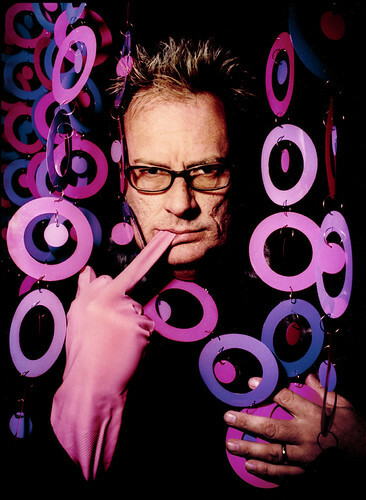 JACK E JETT - TV Presenter/Comedian, a photo by Mark Berry - Photographer & Graphic Designer on Flickr. Über Lavender soap is that rare thing: simple, yet luxurious scent that is authentic and as the name implies - as lavenderish as a soap could get. 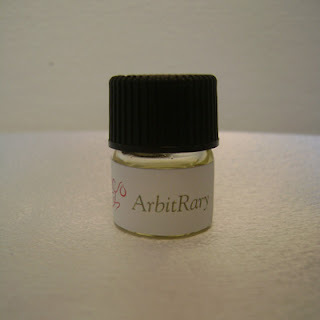 Using a single high quality botanical with its two faces - oil and absolute - renders a more true to nature experience. Rather than just a pale, runny ethereal quality of the essential oil, there is also the lush velvety feel of freshly picked and rubbed lavender buds and elongated leaves. The whole experience of lavender. And bathing with it - or even just rinsing your hands - is not only a cleansing act, but an olfactory experience, immersing the skin in a complex scent and connecting to lavender's heritage as a purifying herb. Each bar of soap looks beautiful - hand-sliced, it looks like a chunk of fine old cheddar and is beautiful to handle. 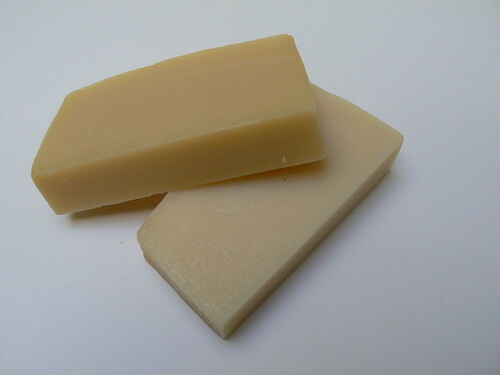 The soap is made from olive, palm, coconut and castor oils - a firm bar with plentiful lather, and is non-drying to the skin. Open Source Soap creates custom soaps from vegetable oils in the cold-process method, scenting them only with pure botanical essences and in fascinating scent combinations. The owner, chemical engineer and soapmaker Schuyler (pronounced "Skyler") Corry, prides himself on disclosing each custom formulas for each batch with the customer, and on the website you will also find some of the house blends and soap recipe that you can try and make yourself (or not...). I personally prefer to leave the process to the expert, and I've handed the task of creating my scented soaps to Open Source Soap. We created Vetiver Racinettes together and plan to make a few more soaps in 2013.